On August 16, 1932, famous aviator, Russell N. Boardman, 34, took off from Springfield Airport for a test flight of his new Gee-Bee, R-1, Junior Sportster, racing airplane, which he intended to fly in the Thompson Trophy Race in Cleveland, Ohio, later in the month. According to witnesses, Boardman’s plane developed engine trouble and went into a low roll before spinning into the ground from an altitude of 800 feet. The plane came down in a thickly wooded area but didn’t burn. The plane was demolished and Boardman was seriously injured. At first there was some question as to whether of not he’d live, but he rallied and recuperated over the next several months. Unfortunately, Boardman was killed in another plane crash almost a year later on July 3, 1933. 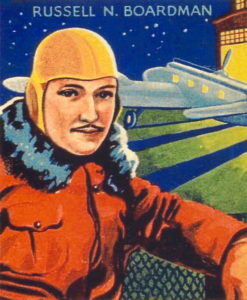 In that incident, he was taking part in a trans-continental air-race and had stopped to refuel in Indianapolis. After refueling, he crashed on take off when a gust of wind caught the wing of his plane. Early in his flying career, Mr. Boardman had survived one other airplane crash in Cottonwood, Arizona. For more information about their historic flight, see the book, Wings Over Istanbul – The Life & Flights Of A Pioneer Aviator, by Johnnie Polando. Boston Herald, “Russell Boardman Dies In Indianapolis, Crashed Saturday In East-West race”, July 4, 1933.